A baby giraffe in upstate New York got more people to his first birthday party Sunday than most humans could muster. 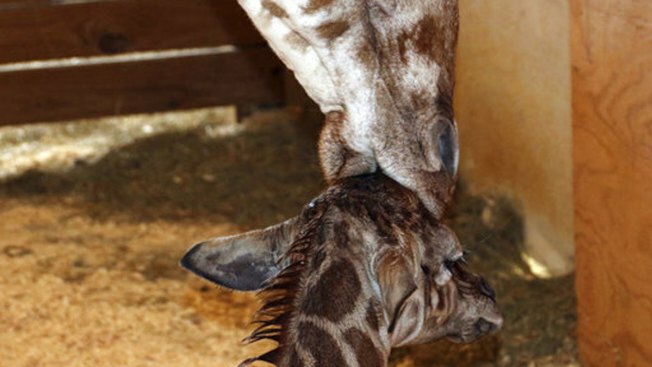 Tajiri, the upstate New York giraffe who may have had the most famous animal birth ever -- a world entry streamed live for tens of millions of people by a New York zoo -- turned 1 on April 15. Animal Adventure Park in Harpursville threw the son of April and Oliver a birthday bash, and streamed it on YouTube where almost 50,000 people tuned in to watch the festivities. Staff at the park put up a birthday banner for Tajiri in his pen, and arranged a dramatic three-tier cake for the long-legged baby on a bale of hay. Tajiri tucks into his lettuce first before biting into his cake, which is specially made and healthy for giraffes. It sounds like a tall tale, but this giraffe romance has managed to captivate the world for more than a month. April's pregnancy drew more than 232 million YouTube live views during a seven-week period. Tajiri means "hope" in Swahili. He has grown to nearly 10 feet tall (3 meters). He was 5 feet 9 inches (1.75 meters) when he was born.